This post is sponsored by Zatarain’s. All opinions are my own. It’s almost Mardi Gras time! If you aren’t familiar with it, let me give you the low down. Mardi Gras – also called Fat Tuesday, refers to events of “Carnival”, beginning on or after the Christian feasts of the Epiphany (Three Kings Day) and culminating on the day before Ash Wednesday. This year, it’s February 9th through the 13th. It’s a huge celebration with parades, beads being thrown, and of course – food. Want an easy way to enjoy the taste of Mardi Gras in your own home? I’m about to show you! Jambalaya is a traditional (and delicious) hallmark of Creole cuisine. It’s one of my very favorites because it’s so versatile. Using Zatarain’s Jambalaya Mix and Zatarain’s Creole Seasoning, you can whip up a hearty and drool worthy Mardi Gras dish easily. 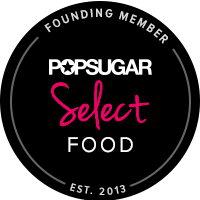 It’s also easy on the wallet…(ssshhh – the taste does NOT reflect that). 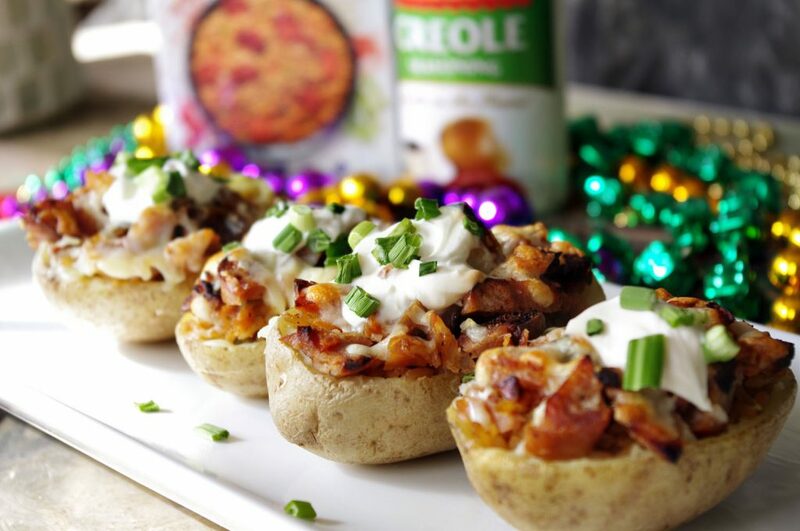 Zatarain’s recently asked me to develop a recipe for Mardi Gras using their Jambalaya. I love Zatarain’s, so that was an easy yes. Ya’ll know how much I love to make fun food, and one of my favorite things to do is to take a traditional recipe and change it up a bit. It’s so much fun spinning classic dishes into something new. This one is not difficult at all, only a few ingredients, and you can have it on the table in no time. These are my Twice Baked Jambalaya Potatoes. You’ll love them! Take it from me – I was so happy with how they turned out, I had one for breakfast the day after making them. As far as prepping the potatoes, my go-to method is to brush them with melted butter and roll them in sea salt, then microwave them for 5 minutes on each side. 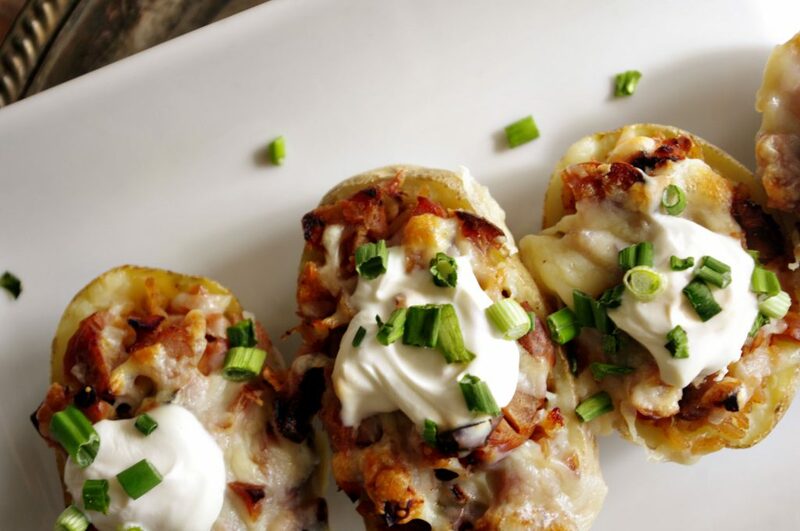 It’s so easy, and fast – AND – everyone will want to eat the potato skins along with everything else!! To a sauce pan, add Zatarain's Jambalaya mix, 2 1/2 cups water and a tsp. of oil; bring to a boil. While the rice is cooking, chop scallions, grate the cheese and slice sausage into roughly 1/4 inch slices. Add oil to a large pan over medium high heat. Add sausage, and sear for 1-2 minutes, then turn to sear the other side for same amount of time. Add 1/4 cup of water to the pan, cover and reduce heat to medium low; sear for 5 minutes, or until done. 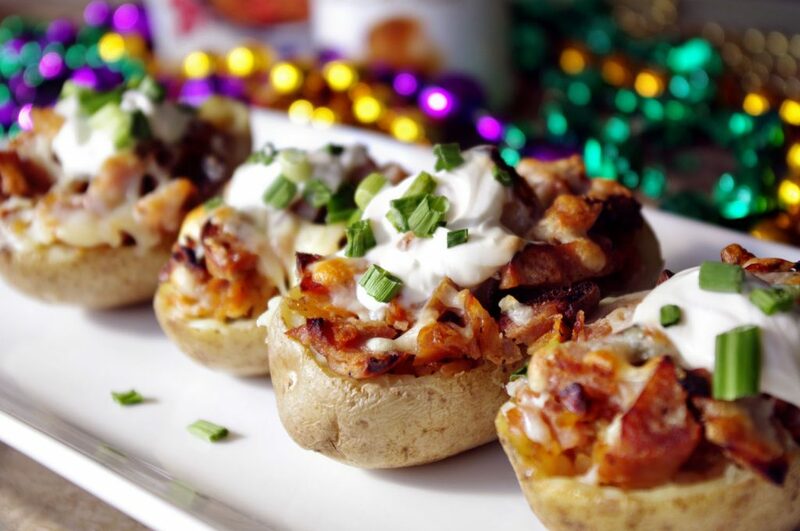 Place potato skins on a baking sheet and evenly distribute enough Jambalaya Mix to each one. Top with sliced sausage, shredded cheese and bake for 25 minutes. Remove from oven, top with sour cream, Zatarain's Creole Seasoning and scallions. cajun, creole, dinner recipes, jambalaya, mardi gras, rice main, smoked sausage, Zatarain's. Bookmark. This is one seriously yummy little recipe! 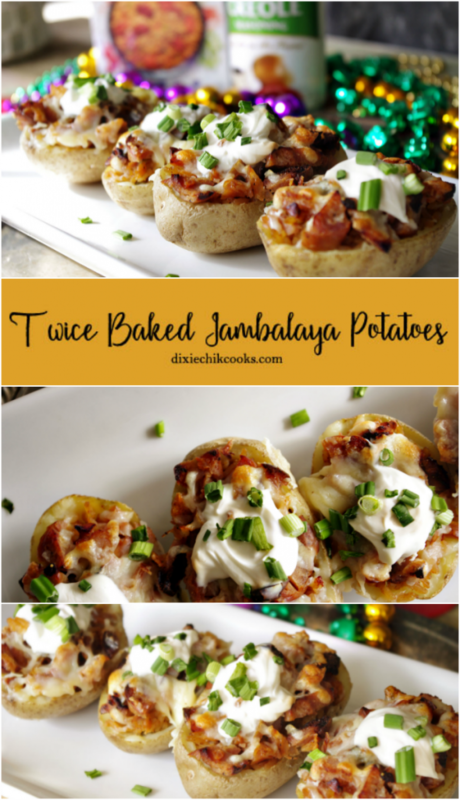 I love the fact that you’ve taken a basic baked potato, and blown the tops off to create something fun that works just as well for a weekday meal as it does for a party! I love the video, and now I have to get the hubby to stop on the way home from work and pick up some Zatarain’s Jambalaya Mix!!! Yum!